When Irvington Community Schools (ICS) was notified by the Indiana Charter School Network (ICSN) about its video competition celebrating National School Choice Week (January 20-26), we turned to one of our resident filmmakers, IPA senior Abby Goebel, to do the work. And do she did! 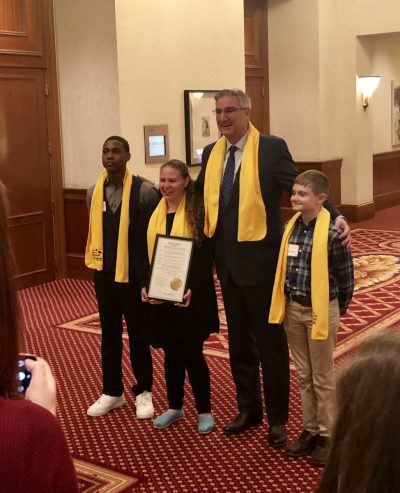 Abby and two other Indiana students were recognized by the ICSN and its partner organization, the Institute for Quality Education (IQE), at a breakfast on Wednesday, January 23. The event, held at the Conrad Indianapolis, included state legislators, school administrators, students, and parents. This proved to be an ideal opportunity to interact with some of the state’s key decision makers, some of whom serve on the senate and house education committees, and talk about upcoming legislation and underscore charter schools’ greatest need: equitable school funding. Not only did Abby receive the deserved acclaim at the legislative breakfast, she brought along two of her fellow Ravens to enjoy the moment: senior Matthew Guevara and junior Mikaila Taylor. To top it off, Abby was presented a check for $1,000 by IQE. What’s more, she had her photo taken with Gov. Eric Holcomb. She continues, “I recorded my voice and then placed the video clips to match what I was talking about; for example, when speaking about my friends, there are videos of my friends. I enjoy editing videos to music, so I chose a free instrumental that I thought sounded happy but with a bittersweet undertone. Abby was indeed humbled and thrilled when she received notice of being an award winner. “I was ecstatic! — and shocked that the small video I put together was selected. This contest has given me more confidence in my ability to make videos.” She is planning on following in her older sister’s footsteps by majoring in Film and Media Production at Taylor University (located in Upland, Indiana) next school year. 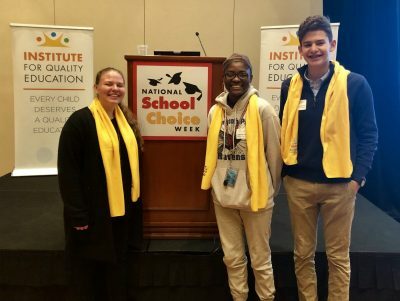 Learn more about National School Choice Week here: https://schoolchoiceweek.com. IPA and ICMS Music Students Go for the Gold – and Get!